Every year I plant a large variety of tomatoes, and I'm losing track of how long I've planted each different variety. 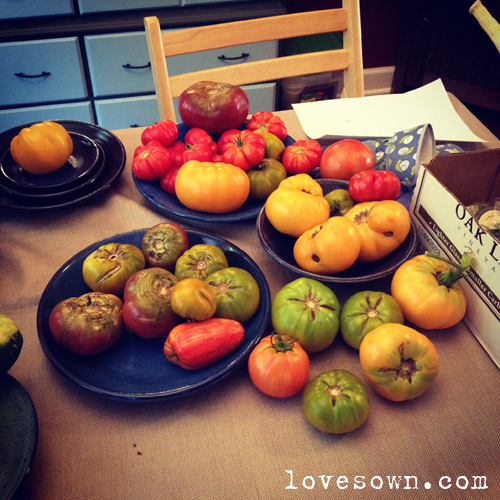 The obsession began when I purchased a packet of Burpee's Rainbow Heirloom Mix. That packet included Omar's Lebanese, Dutchman, Djena Lee's Golden Girl, Golden Sunburst, Aunt Ruby's Germany Green, and Black Russian. Since I didn't know for sure which tomato was which, I saved from the tastiest and labeled the seed bags "Large, red beefsteak, sweet, Omar's?" and "pink beefstake, large, not many seeds, Dutch?" Each year I've continued to plant those pink and red seeds, as well as Aunt Ruby's German Green. I liked the large red ones so much, and thinking they were Omar's Lebanese, I ordered some new seeds on ebay. Those tomatoes were terrible and nothing like my red ones. I don't know if the ebayer was wrong or it it was the weather that summer, but I renamed my saved red seeds "Red Kiss of Summer" and didn't plant the ebay Omar's again. There is no guarantee that my tomatoes aren't changing over time as I continue to save seeds. However, this summer, the pinks are more pink than they've ever been and the Red Kiss, though smaller, have been more consistent in production. I'm guessing adaptation is a good thing! As far as the other tomatoes in the garden this year, the results have been mixed. 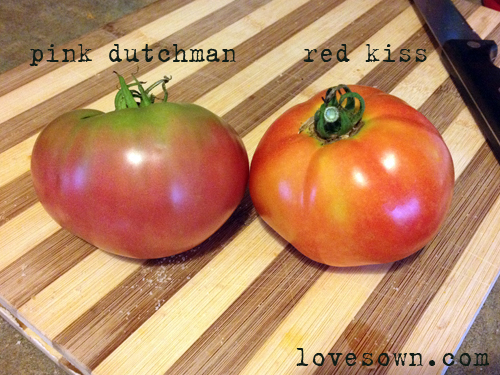 Pink Dutchman - The deep pink-purple color is beautiful, and the flavor is mild and sweet. There aren't too many seeds, and they are great on a a sandwich. Red Kiss - This is similar to the pink, though slightly larger and slightly punchier flavor. It is probably my favorite. Speckled Roman - Again this summer, their production has been slow. Some of the plants are just beginning to flower. They aren't juicy, but are good for sauces. Costoluto - These plants produce many beautifully lobed small red tomatoes. The flavor is super tomatoey, and I don't particularly enjoy it as a slicer. This is also good for sauces. Matt's Wild Cherry - These have taken over the garden and are delicious. They produce many tomatoes at a time and keep producing all summer. The branches tend to yellow and die off quickly. Persimmon - This orange tomato is simply fantastic. It is large, juicy, and a fantastic slicer. Black Krim - This one will not be planted again next year. 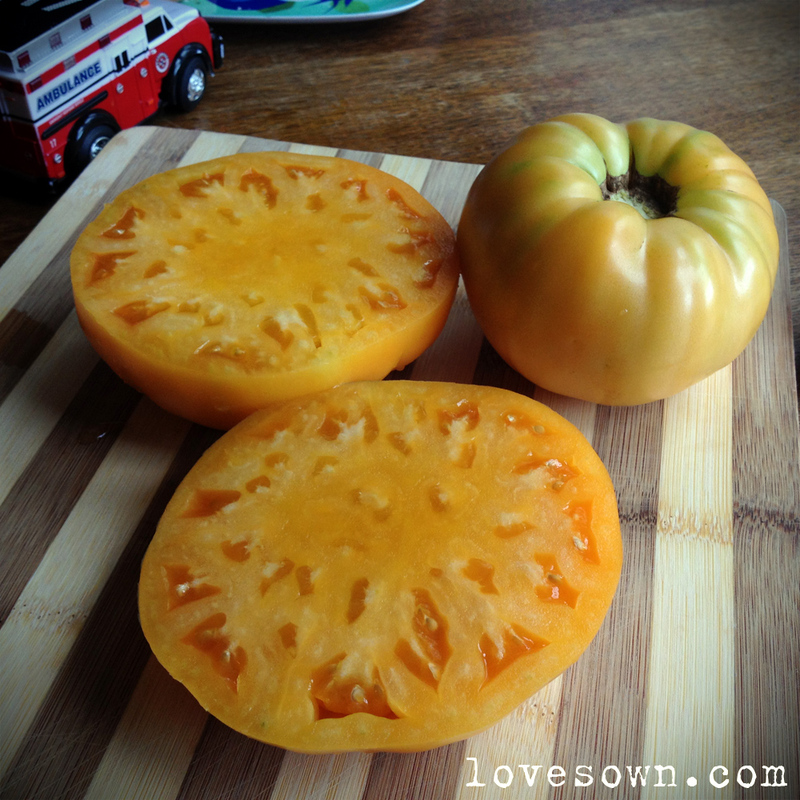 The first tomatoes were mealy, and later ones were small, very seedy and tart. Brandywine - While they are super tasty, they are prone to disease. They don't produce many fruit at a time either. 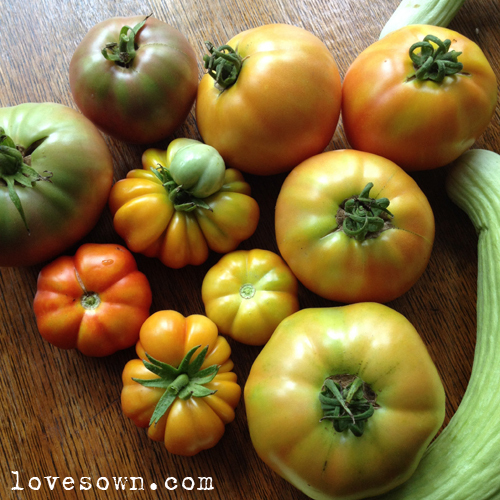 Aunt Ruby's German Green - These have great tart flavor and good texture. They make great slicers, and the bright yellow-green color is unexpected. thank you for the review! We have a farm here that grows only organic heirlooms, and I've been keeping the seeds from the tomatoes I purchase from him. I'll have some (hopefully) to trade with you later! I look forward to it! I just checked out my one Brandywine, and there are three or four tomatoes growing. I guess it found a second wind. There are two or three other mystery plants growing that are producing as well. Can't wait to see what they are!